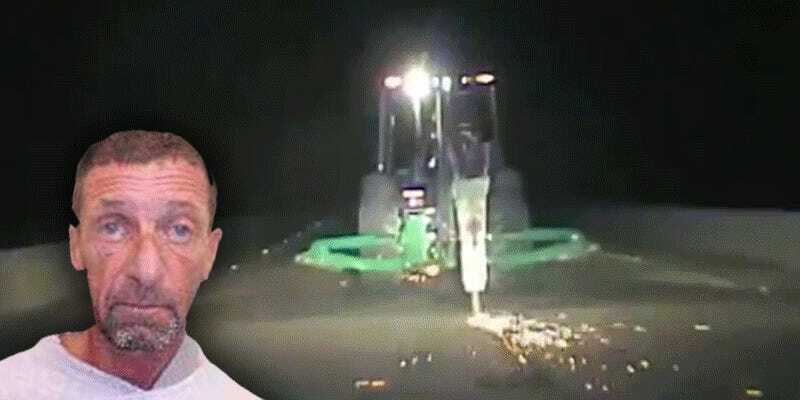 I know even typing the word “Florida” here will be seen as unnecessary, but in South Florida, a 59-year-old man stole a backhoe and took it on an hour-and-a-half joyride up and down a bridge, tossing boulders and scraping the road surface, sending showers of beautiful sparks into the air. Blahnik took the backhoe up and down 7 Mile Bridge, causing damage to the surface of the road and to the sides of the bridge. Of course, there’s some dashcam footage from one of the police cars involved in the chase. One police car suffered minor damage from the backhoe as well. Eventually, some spike strips put an end to the fun, and Blahnik was arrested and taken to a hospital. Not too coherent? I’m stunned. STUNNED. Still, I’m sure everyone learned a valuable lesson about driving at reasonable and prudent speeds. Fine work, sir!